Fair. Text in Chinese. Sewn binding. Cloth over boards. 36 p. Intended for a juvenile audience. A readable copy. All pages are intact, and the cover is intact. Pages can include considerable notes-in pen or highlighter-but the notes cannot obscure the text. An ex-library book and may have standard library stamps and/or stickers. At ThriftBooks, our motto is: Read More, Spend Less. Simply one of the best picturebooks of the last 20 years. 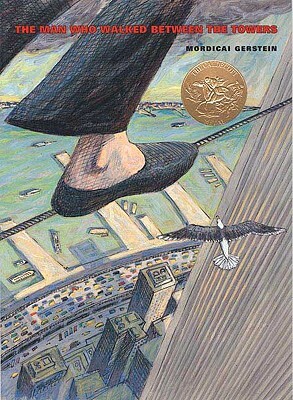 Mordicai Gerstein has perfectly captured the mischief and playfulness that defines Philippe Petit. Mesmerizing artwork tells a fascinating story. A masterpiece. I think that this is a very cool book. There are not many picture books about 9/11 yet, and I think that this presents it in a nice way. I really liked the fact that they told an interesting story about the Towers and made a reference to the events of 9/11 at the end, rather than making the entire book about 9/11. This book is good for any age; for me, the book invoked memories and feelings that I had for 9/11. For an older person, it could remind them of the walk between the towers. For a younger reader, it would be a great to use in a lesson about 9/11. I thought that the artwork was beautifully done, and I loved the perspective that the fold-out pages give! Overall, I thought this was a wonderful book, and I bought it to use with my future students and children!